Anne Jan's 2009 birthday puzzle: Cross the river. The object of this puzzle is to get all people to the other side of the river. At most two people can be on the raft at once. You will need at least one adult to operate the raft. The policeman can’t leave the criminal with other people. You can’t leave father alone with any of the girls as well as mother with any of the boys. You will need to carefully read the Chinese text and then click on the big round blue button to start the puzzle. In case you need a hint you can press on the rectangle button on the first screen. 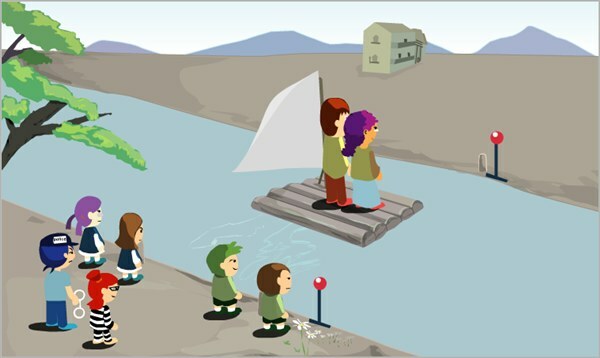 Click on a person to move him/her on or off the raft. Click on the red button to operate the raft. Good luck (perhaps you will need it). One tip: You will need less clicks than my age: Am I so old or are you so smart? Puzzle cross the river: Click here for the full screen version.